What kind of Orthotic Provider would I be if I didn't make a play on the word SPRING when it comes to this time of year (original Blog Spring of 2018). What type of Professional would I be if I didn't make mention of that feeling in each step when you wear good shoes and experience therapeutic Orthotic Foot Alignment! From a different perspective, poor shoe shoes and foot alignment without your orthotics can become a real pain in each step. So lets prevent that from happening and keep that Spring to each step you take! We hope you are all practicing healthy habits of daily living. We want to remind everyone to keep active, stay sporty and don't forget to wear your orthotics! Where are your orthotics? Oh my! Are you due for a 2018 pair? We recommend a re-evaluation every 1-2 years. We invite you and your family in to take advantage of our newest technology; a 3D Foot Scanner and an Electronic Gait Scan device. Top notch technology to ensure we are providing your feet the best support in the industry! We offer a wide variety of services including the prescription, fitting and dispensing of custom orthotic inserts and orthopedic shoes. 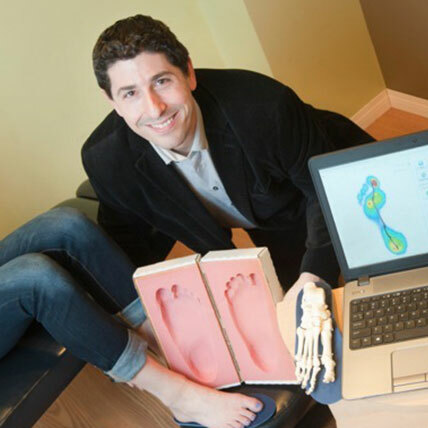 We are here to provide a therapeutic approach to treating foot, ankle, knee, hip and lower back pain.Vancouver Orthotics is also here to help improve posture, gait, alignment and overall balance. Watch Dr. Michael being interviewed on his YouTube Channel. FEET FIRST! Foot support, spinal support and overall postural enhancements through the use of custom orthotic inserts. Foot pain and Flat Feet: these are a common set of complaints among our patients.This doesn’t come as a surprise given the nature of human activity as we tend to be on our feet all day and our required mobility.